The time to go to Cuba is now. This island nation is currently going through a major transition from an isolated community cut off from the world, to a connected tourism hotspot. Changes are already making their way through which can be seen from the cranes dotting the city skyline of Havana and men operating horse and carts while talking on their smart phones. But it’s not too late to go! 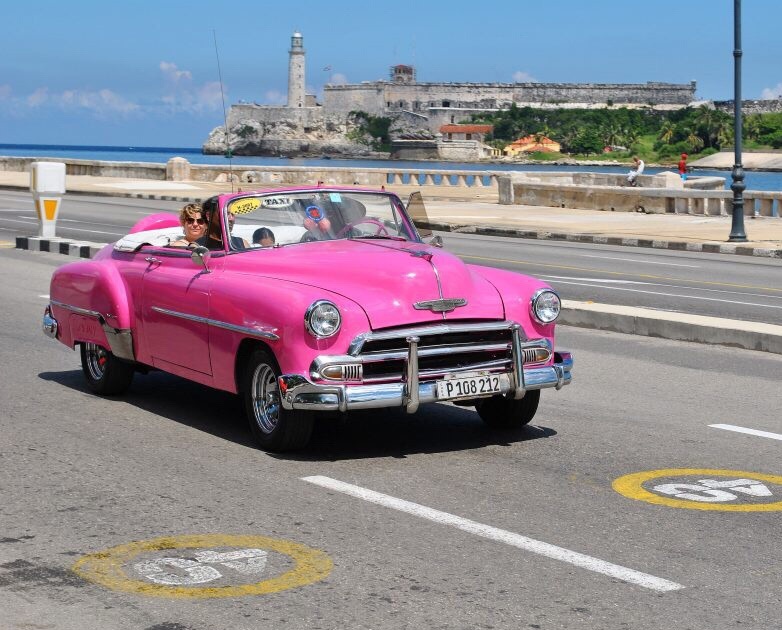 The tourism industry is growing exponentially but in comparison to other countries Cuba still sees very few tourists. So now is the time to get in ahead of the crowds while the beaches are quiet, the cocktails are cheap and taxis are colourful vintage cars. While ferry services are being developed from Florida, the only way to get to Havana is to fly. Flights have recently begun operating out of the United States for the first time in over 50 years with 6 airlines approved for direct flights. Before this most travellers went via Mexico or Caribbean island nations. Operators include American Airlines, Air Canada, Cayman Airways, InterJet, Cubana, Aeromexico, JetBlue, Copa and many others. European travellers can also choose to go to Cuba as part of a package offered by tour operators such as Thomas Cook. Note than when booking flights that the city is written as ‘La Habana’ often as that is Havana in Spanish. To enter Cuba all travellers need to purchase a tourist Visa. This can be done at most airports where you board the flight or in some cases the flight may go via another Caribbean island or Mexico so that you can purchase a visa there. Cayman Airways does this to get around the former no-flights-from-the-US rule. The flight would go from Miami to Grand Cayman where you would exit the plane, legally enter the Cayman Islands, walk outside the airport and re-enter back through departures. You can then purchase the tourist visa card and then board the plane for Cuba. It sounds complicated but it is a fairly smooth process. When you fill out your visa card you may be given a form asking you to specify your reason for coming to Cuba. There are 12 options to choose from with one of the more common ones being ‘to help the Cuban people’. It is virtually unheard of to be asked for evidence of this purpose but it may be worth being prepared with a flyer or some other supporting document just in case. Note: Visa and entry rules change often and this information is based on our experience only. For the most up to date information contact your nearest Cuban Embassy or Consulate. It is important that you bring enough cash with you for your entire time in Cuba as ATMs are rare and ones that work are even rarer. It is recommended to bring cash in Euros or Pounds as you will be charged a 10% fee to change US Dollars to Cuban Pesos. 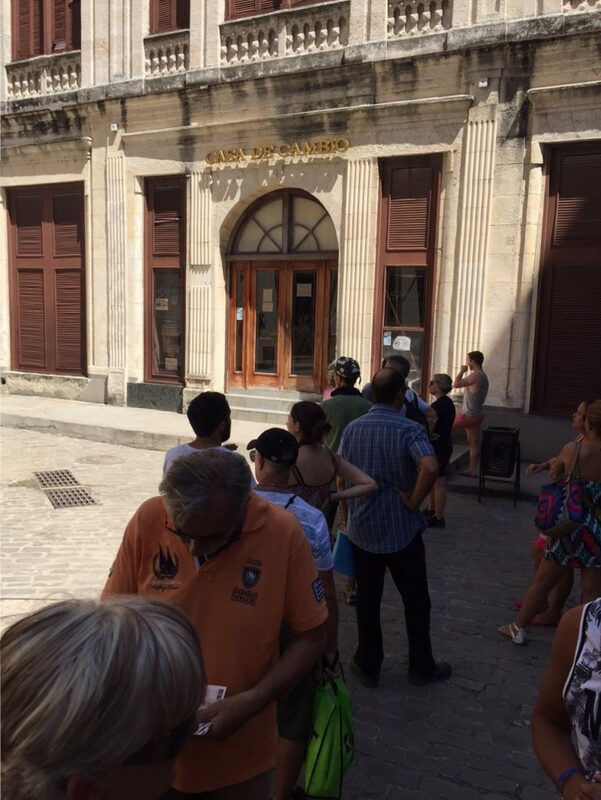 Try and change all your money in one go, preferably at the airport, as the lines at the cambios are long and it is a very boring way to spend your precious time in Cuba. There are two currencies in Cuba, CUC and CUP. CUCs are the ‘tourist’ currency and 1 CUC is worth about 25 CUP. CUCs are used widely and it is unlikely you will see CUPs unless you go to areas that tourists rarely frequent, but it can be handy to have a few if you like going off the beaten track or where things are priced a little cheaper. This cute little plaza is tucked away between alleyways and this hidden feel adds to its charm. The square is lined by brightly coloured buildings and the centre is marked with a pretty fountain. It is easy to spend a few hours here sitting at one of the restaurants, just watching the world go by. Keep an eye out for the funky statue of a naked woman holding a fork and riding a rooster! 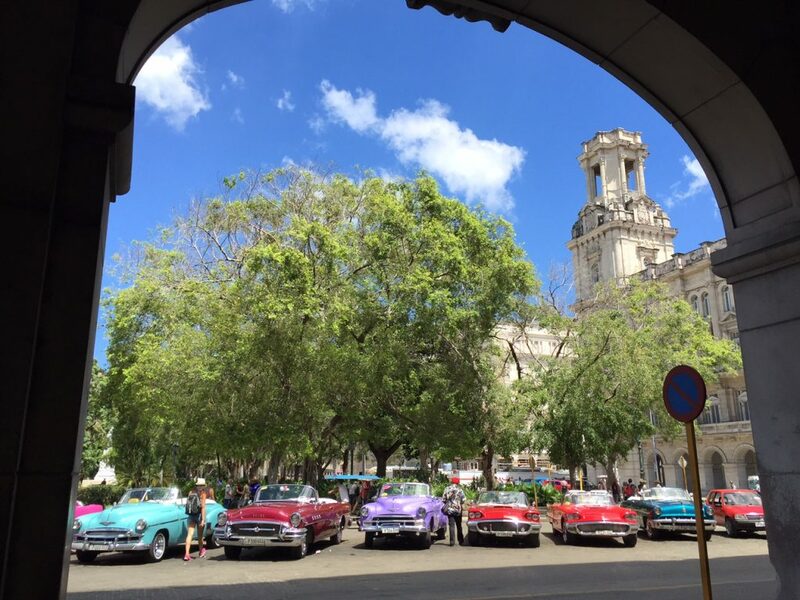 Cuba is one of the only places in the world where taking a taxi is a tourist attraction! 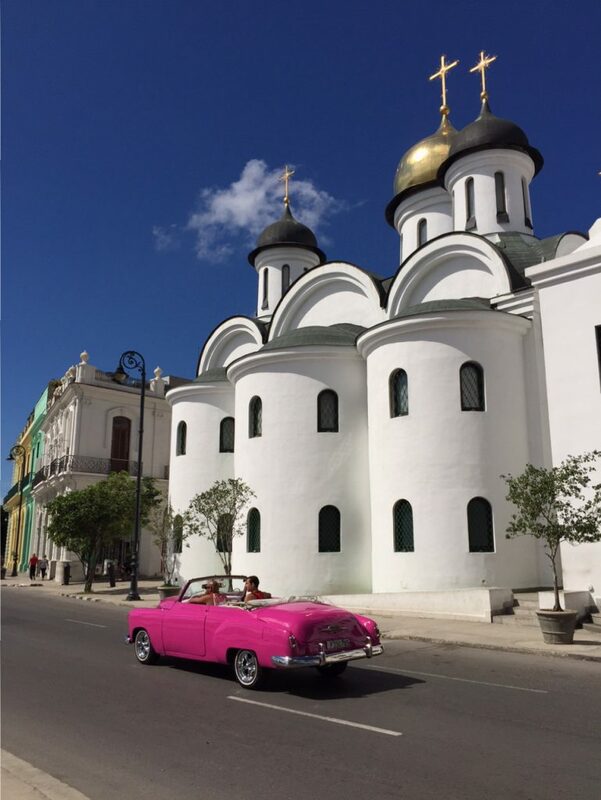 Vintage cars are still very common in Cuba so the odds are high that your taxi will be one too. The best way to confirm this though is to see the car before you commit, which means flagging one down in the street, but this won’t be hard as they all beep at you as they drive past. There are no meters in Cuban taxis so make sure you agree on a price before getting in to avoid being overcharged at the end of the journey. Then just sit back and relax as you zip in and out of the streets of Havana. 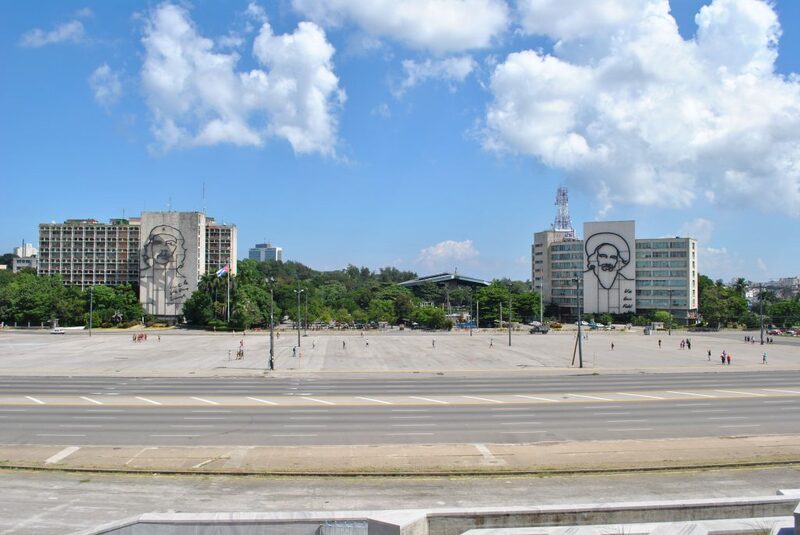 The Plaza de la Revolucion is of high importance to the Cuban people. It has been the location of multiple important speeches, including an address by Fidel Castro that attracted over a million Cubans who packed the square to listen. The likenesses of Che Guevara and Camilo Cienfuegos look down on the square from the multistorey buildings on the north side of the square. To the South you can pay 3 CUC to go to the museum at the Jose Marti Memorial or just 1 CUC to go up the stairs and take photos of the commemorative statue and the plaza from the high vantage point. 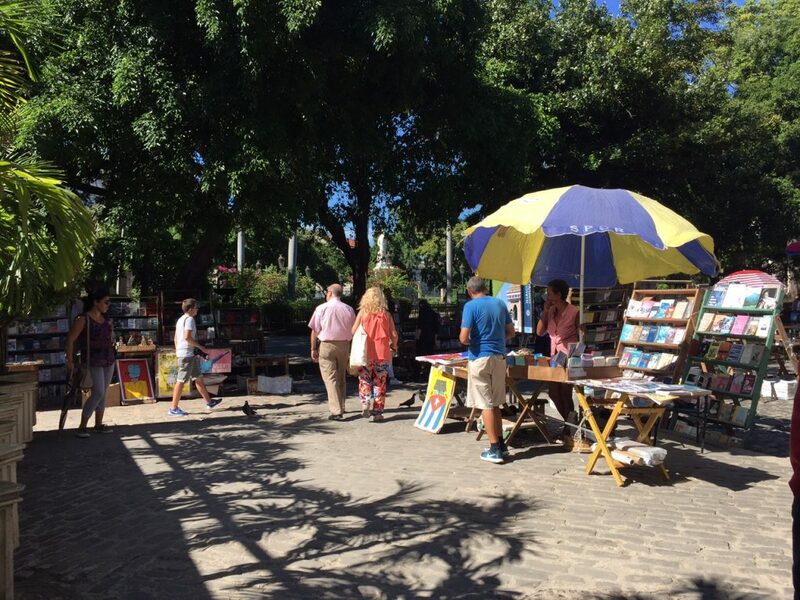 Plaza de Armas is the centre of the tourist scene in Havana, but don’t be put off, it means that the square is now lined with little market stalls selling historic Cuban items. You can pick up old bank notes, coins, posters, books about the revolution and various bits of bric-a-brac. Haggling is recommended and you should look around the plaza first as many of the stalls sell similar items and the prices will vary. 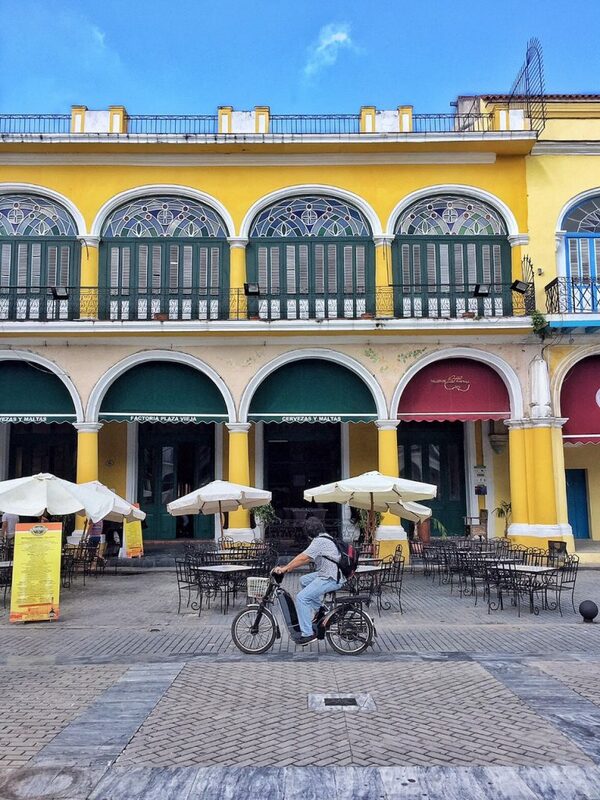 This square not only has a useful cambio to exchange your foreign cash but also hosts the Basilica Convent, a beautiful old church and the centrepiece of many photos. If you are interested in a horse and cart ride around Havana this is the place to do it. A relaxing stroll along the malecon is good for those who are looking for an ocean breeze after wandering the claustrophobic streets of Old Havana. Make sure to visit the beautiful white Our Lady of Kazan Orthodox Cathedral on your walk. The white paint shines brilliantly when the sunlight comes over in the afternoon. Who doesn’t love a tour that ends with a free shot of rum! The tour costs 7 CUC and takes you through the museum showing the development of the rum industry in Cuba and its cultural significance. Through models you are shown an overview of the rum making process and bottling plant. 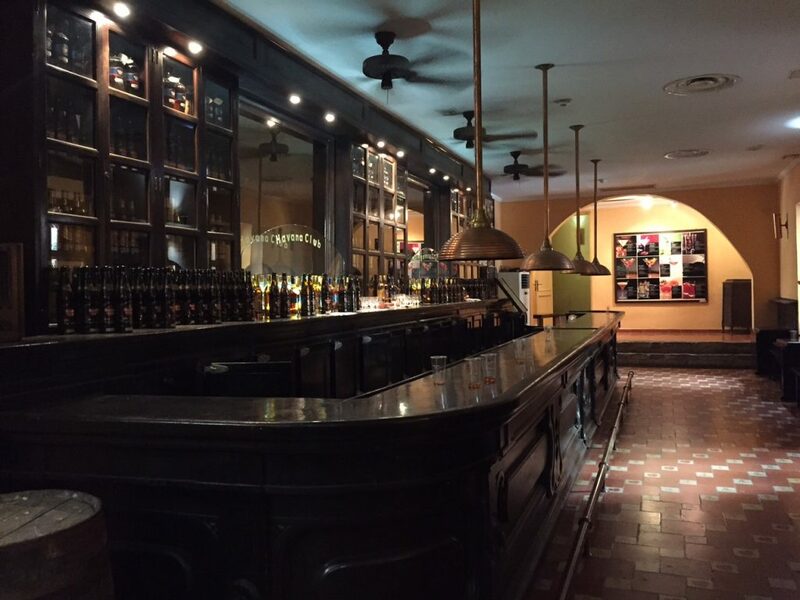 The tour ends with a taste of the 7 year Havana Club rum and of course a walk through the gift shop. 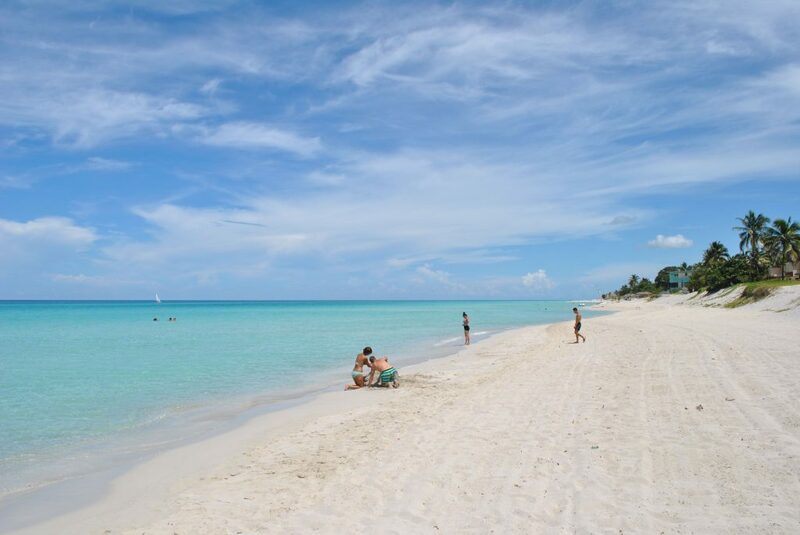 Varadero is located about 140km to the East of Havana and the beach runs along the west side of the peninsula. It might seem out of the way but it is well worth the journey. 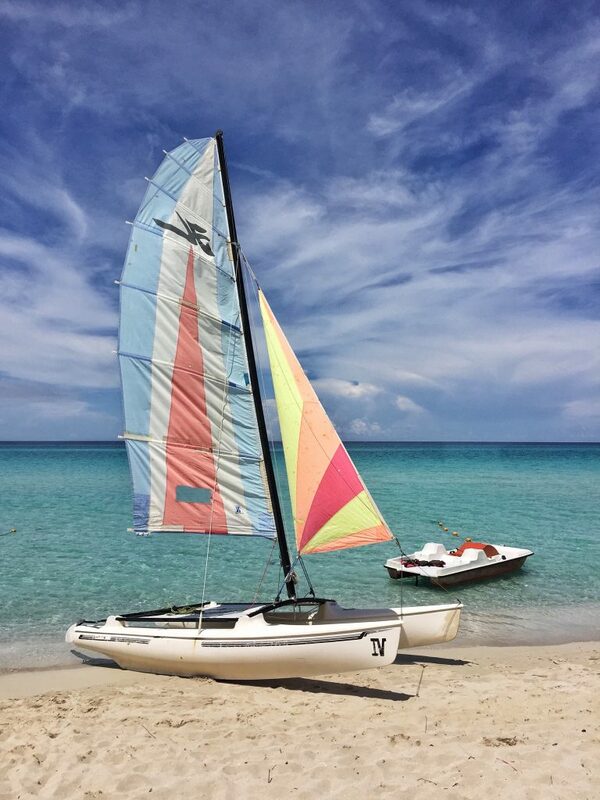 Varadero Beach is picture-perfect with pure white sand, clear blue water and colourful yachts skimming the horizon. There are lots of great spots of sand to choose from as the beach is 22km long. If you want a quiet place with no one around you will find it, but you can also go to beach bars with shady umbrellas, deck chairs and cheap mojitos if that is more your scene. Clear blue water, white sandy beaches, what more could you want! The Viazul bus is the most efficient way to get from Havana to Varadero. The bus runs four times a day and takes about 3 hours at a cost of 10 CUC one way or 20 CUC return. Note that unless you booked your tickets before you came to Cuba online then you will need to buy them in person at the Viazul counter at least 1 day before departing, preferably 2 days. If you have a group of 4 you may be able to hire a taxi for around the same price as the bus depending on your bargaining skills. While the journey can be done as a day trip, it may be more rewarding to stay a night or two. Walking is the cheapest and best way to get around Havana. 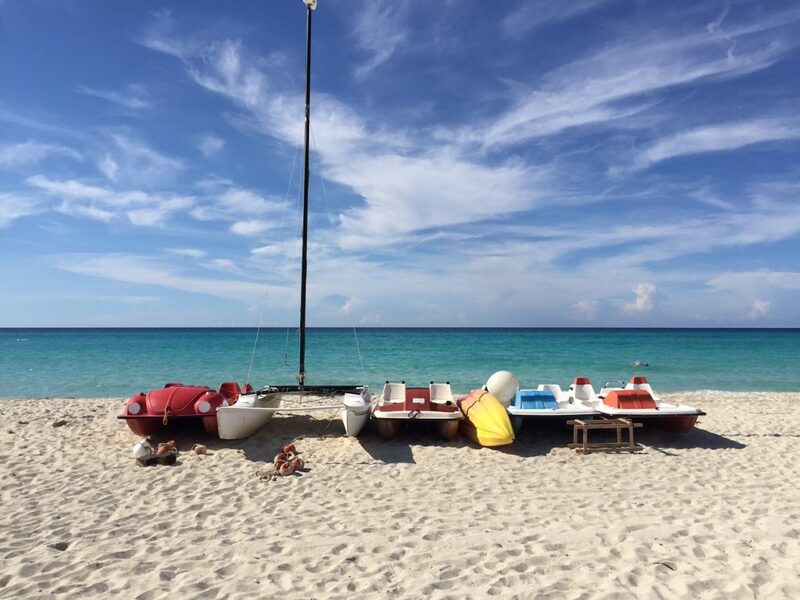 This is where you will get to see the real Cuba. Once you go off the main roads you get to see the lifestyles of the people who live there. There are men sitting around card tables playing dominos, children playing soccer in the street and women cooking up all kinds of delicious meals. Don’t miss this opportunity. Go into those back streets! Taxi’s are the other main way to get around Havana and as mentioned earlier the vehicles are sometimes vintage masterpieces. Just make sure you agree on a price before driving off. Buses are a much cheaper option if your Spanish is good and you don’t mind being packed in like sardines. 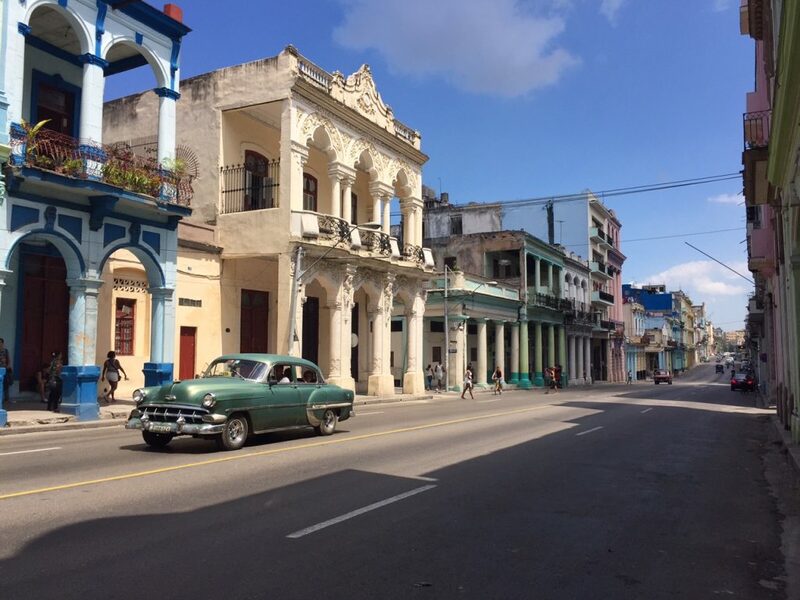 Walking the streets of Havana is the west way to experience the culture. This trendy warehouse turned bar is the new happening place in Havana. The name literally means ‘brewery of former warehouse of wood and tobacco’. The drinks and food are priced at the higher end for the area but the décor is appealing and the beers are huge. The gimmick here is that you can purchase a cylinder of beer with a tap for sharing at the table. Not a bad gimmick really. 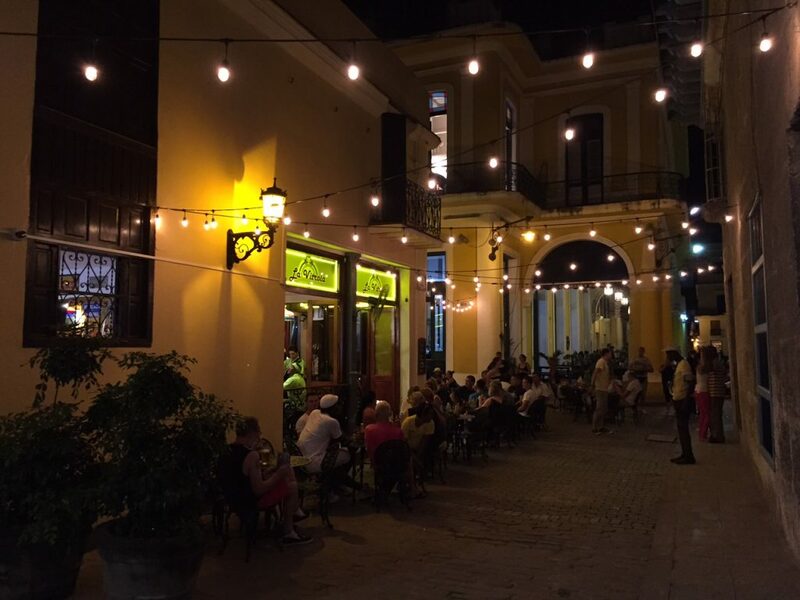 This restaurant offers old style charm and some of the cheapest seafood and cocktails on the Obispo strip, which is a main thoroughfare for tourists filled with restaurants, shops and bars. You can get a mojito for 1.95 CUC and a lobster tail with rice and beans for 9.95 CUC. If you are looking for something a little cheaper they also do a nice pork dinner for 3 CUC. 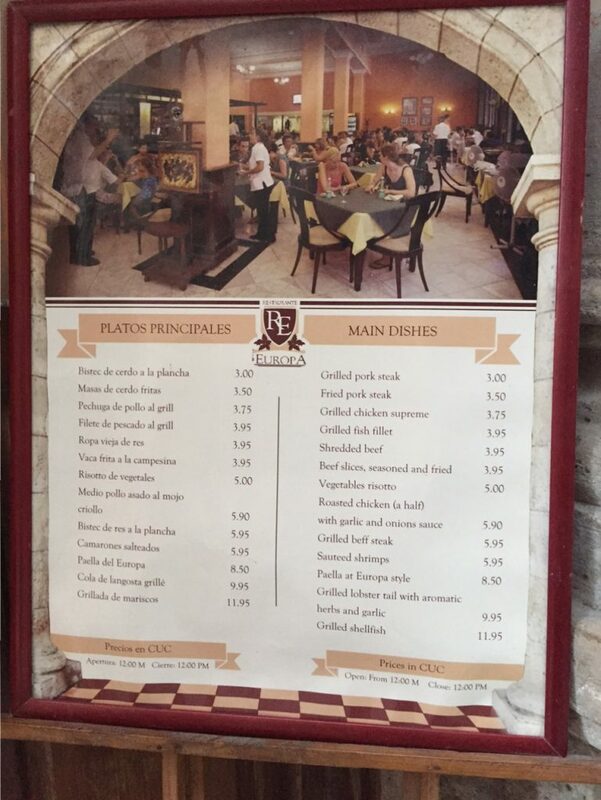 Due to food shortages, they often don’t have everything on the menu available but what they do have is well priced and delicious. The only thing missing is an air conditioner. You can’t go wrong with these prices! Located next door to the Our Lady of Kazan Orthodox Cathedral is a little cantina that sells simple but large sized pizzas for 2.50 CUC. They also offer cheap burgers, sandwiches, beers and soft drinks. 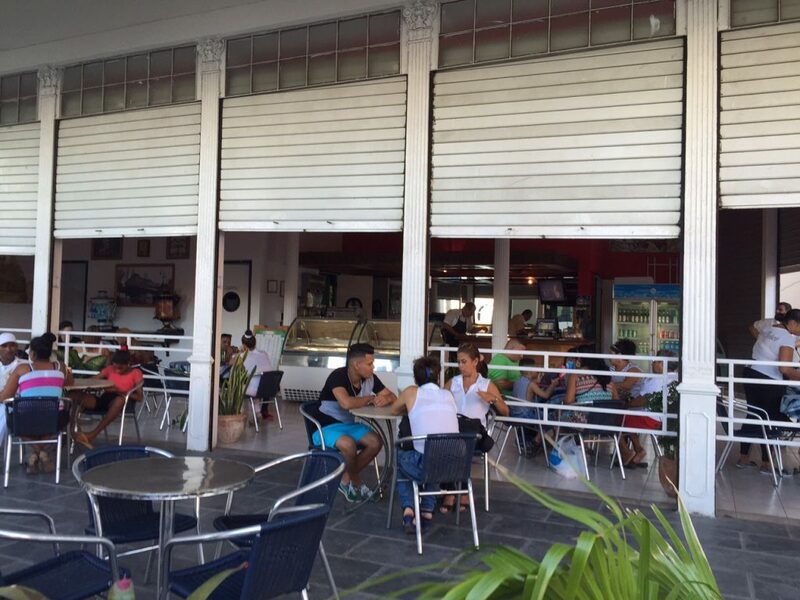 Great for a lunch break on your walk along the malecon. Unfortunately they are only open for lunch. This cantina wins with its excellent lcoation and cheap pizzas, beer, sandwiches and soft drinks. Most accommodation in Havana (and all of Cuba) is currently still in Casa Particulars. These are a cross between a homestay and a hotel where you have a room in a family home, often with breakfast available at an extra charge. Many casas are currently listed on Airbnb where you can see reviews before you go. Otherwise you can turn up in Cuba and find many people offering accommodations at bus stops and airports. Make sure to see the room and decide on a price before you commit. The Hostal Bredent is a modern casa particular in Havana with rooms featuring rare luxuries like split system air conditioning and a refrigerator, which can be hard to find in Cuba, for a reasonable price of 35-40 CUC per night. Breakfast will cost you another 5 CUC.